We’d love your help. Let us know what’s wrong with this preview of In December My Heart’s Full of Spring by Kate McMurray. Two men find each other at the top of the Empire State Building on Christmas Eve. 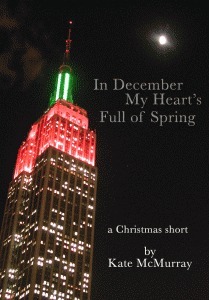 To ask other readers questions about In December My Heart’s Full of Spring, please sign up. I liked it but i really wanted an epilogue so we could see how the friendship/relationship of Max and Allen developed, and to see them a few months or some years later. Reviewed with other Kate McMurray shorts at The Armchair Reader for Kate McMurray Week! 3.5 stars. This is a good short holiday story about a serendipitous meeting at the top of the Empire State Building on Christmas Eve. Really nice start to what could be an interesting relationship. 3.5 stars. Good short holiday m/m romance about two guys who find themselves on top of the Empire State Building together on New Year's Eve.